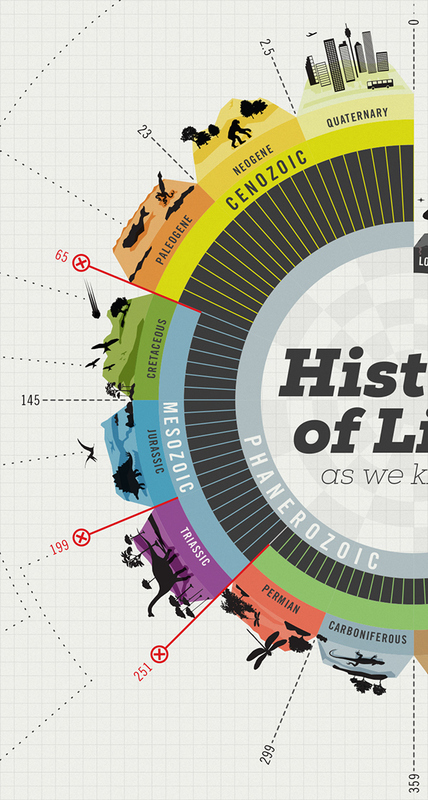 This poster ($20) created by Juan David Martinez displays the entirety of the history of life as we know it, from the Precambrian era up until present day. Segregated by millions of years sections and displaying mass extinction events this poster briefly presents everything we know about the history of our civilisation. The Precambrian era was host to many volcanic activity and meteorite impact, and multi-celled organisms are the only real life present. During the Paleozoic period fish, amphibians, anthropoids and primitive dragonflies began to evolve on Earth, though it was host to two mass extinction events. The Mesozoic era is when it starts getting really interesting; dinosaurs and birds populate the Earth and the continents begin to drift so that they resemble what we recognise today. Human beings finally appear towards the latter half of the Cenozoic period, displaying just how young and new we are to this planet on the grand scale of things.